Once you experience our votives, you will no longer believe that all votives are the same. 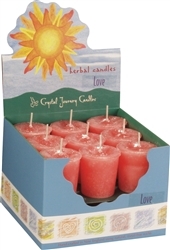 Numerous customers have told us that Crystal Journey votives are the only candles that sell in their store. There is no mystery behind this success. When you use the finest ingredients and offer a broad selection of scents (over 100 and counting) and combine that with great pricing you create a winning product. Our votive candles are made from highly refined waxes so pure that they are considered food grade, wicks constructed from cotton and paper and essential oil blends.